My Dad fought in the Great War in the Anzac forces. He brought his own horse from Brisbane to France to participate in the 5th Light Horse. My greatest fear is Donald Trump. My writing style is warm, historically accurate with an unexpected edge. Hard-working, thorough, patient, curious, thoughtful. I have never considered 'being' a character in another book. At my age, although many aspects of historical eras are fascinating and tempting to visit in a time machine, the prejudice against women’s freedom of movement and activity, and the ignorance of medicine in past days would keep me right here in 2017. My 10-year-old self was playing baseball and romping on the beach in the year 1953. I listen to her all the time and she can’t tell me anything I don’t know. What’s a better question is what I would tell her! Not the other way round. And those things are very personal, private and would, if she followed my advice, change my entire future! I probably would have had an entirely different life and wouldn’t have your letter in my hands! I have had many influences in my long, productive and happy life. It would take a long dissertation to say how and why and I don’t have the space here. My editor, Phyllis Fogelman of Dial Press, taught me much of what I know over our 26-year friendship and publisher/author relationship. I’ve also learned so much from other editors and art directors. I learned from teachers, my parents, from my husband, Tom, my children and their children. From everything I have experienced, I have taken something large or small. My career simply happened because, I suppose, it was on my cards all along. I haven’t any single favourite word, favourite book or favourite influence. Heaven forbid I should be stuck with only one book to read for the rest of my life! I have many books to reread and hope I have the years left in life to do so. In a rare visit to Australia, children’s book lovers will have the chance to meet a doyenne of the children’s publishing word, Rosemary Wells, at Gleebooks, in Glebe, on Tuesday, February 13. 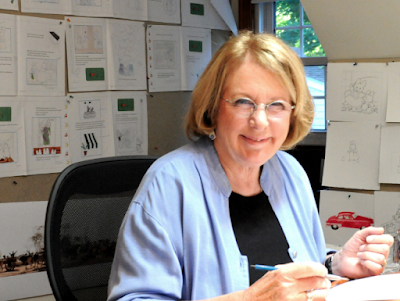 The delightful award-winning illustrator of many children’s book favourites, including the much-loved Mother Goose rhymes, and author of the Felix and Fiona series, Rosemary Wells has created more than 135 picture books over four decades. Rosemary will talk tabout her incredible career and work. She will also address an issue she is deeply passionate about: the need to put aside all electronic devices and bring our children into the world of turning pages, and parent’s voices, to help foster a lifelong love of reading. Book for this event at www.gleebooks.com.au. For more information on Rosemary, see www.rosemarywells.com. Lovely insight. Love the first question. Mxox. Indeed, Maria. This is a fascinating period of history and human valor. Ed.